Hi Alan, I’ll give that a try but, I agree that rF2 is evolving nicely and the new GT3 pack is a very good addition to the title. Update: So I tried changing the “Steering Resistance Saturation” as suggested and think it helps a bit but, I also increased the “Steering Resistance Coefficient” to 0.3 with the Small Mige so I could then reduce the “friction” setting in SimuCube (needed to stabilize steering looseness); this combination seems to behave a bit like “Gyro” in AC so thank you Alan, for sharing your tip. I also like to add a bit of “Brake Effect” (enable “Brake Effects on Steer Axis”: 1 / “Brake Effects Strength”: 00010). This adds additional steering resistance during hard braking and I find that it adds some additional intensity to my racing battles. 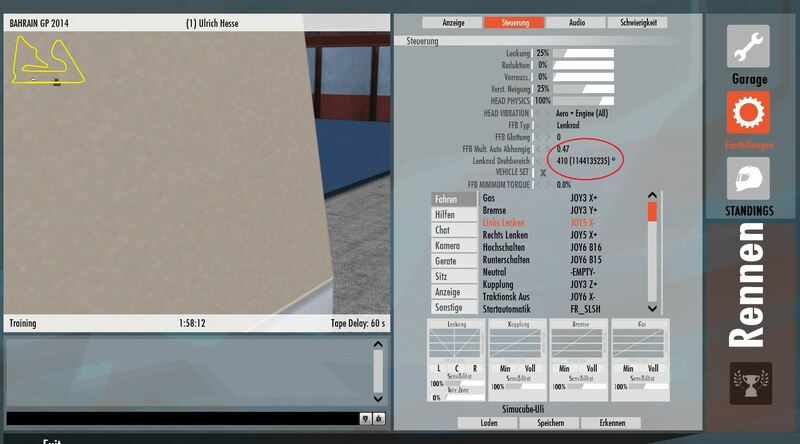 Is it possible to share your settings in rf2, the simucube Software and maybe the Controller. Json file. First (in case you are not aware), some tips that can save you from making common mistakes with rF2 controller files. when you setup your controller in rFactor2, the game will save any changes you make to the controller settings when you exit the game; that is the generic “controller.json” file in the “rfactor 2 \ UserData \ player” folder" folder (not the file to edit manually). You should preserve the game default controller presets by saving the custom profile you edit under a unique name immediately after assigning your controls (this is the file that you would edit in “rfactor 2 \ UserData \ Controller” folder). If a default preset should be accidentally altered or seem wrong in some way, you can delete the preset from the folder (manually) and use Steam Validation to download a new default preset. If you use another custom controller profile, it’s a good idea to save a copy somewhere else in case you ever need to reference it or restore it later. You will likely want to reduce the per-car FFB strength (default = 1.0 / probably below 0.5 to start with) in rF2 to avoid signal clipping and to reduce the over-all steering-resistance when using high or max output in SimuCube. Wheel was rattling without a deadzone in the middle to the left and right, pulling to the left and right and not giving the correct ratio with the car. Be sure you are using the OSW Preset in rF2 so that the force effects are not overly strong, assign your controls and save it using a unique name, then edit that json file to enable the Auto-Rotation feature as described in my post linked above. Dean’s instructions are spot on. 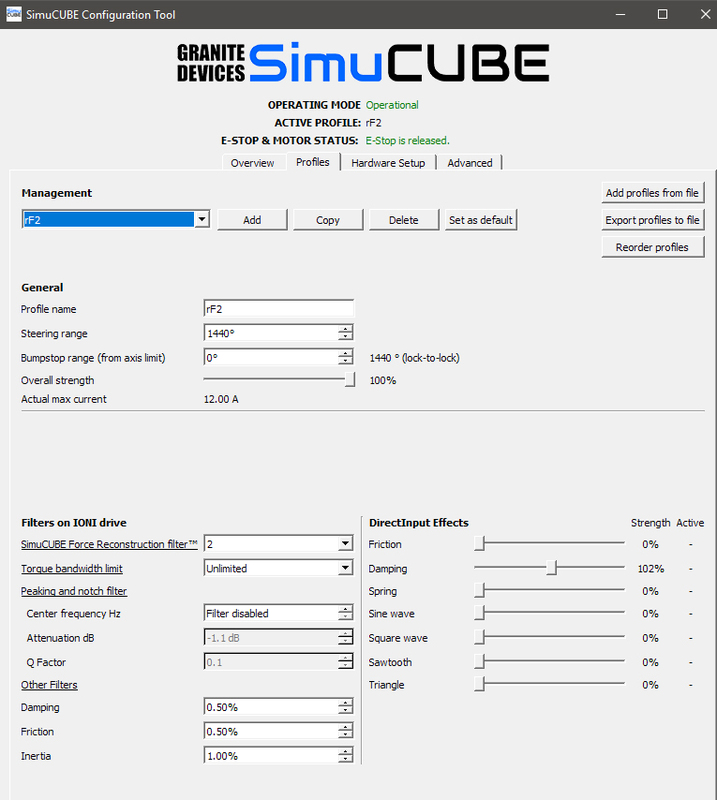 It is critical to load S397’s new OSW Simucube profile fresh…worth having to re-assign controls. The work S397 did for us Simucube users in last update (probably by studying Dean’s and others’ work on here) transformed rF2 on my large Mige. It is now as good if not even more refined than AMS. Just as an aside…for a great experience of what rF2 is now capable of on this Simucube…take a new Porsche GT3 R for some laps on Mid Ohio. Physics and ffb are dreamy. Strange things going on with my Cube and rF2. I did exatly what morOSWer (is he Dean?) discribed. I did 2 PC restarts, everything was fine. 3rd restart, same Problem again. I watched a video on you tube and figured out, that in my rF2 Controls window something maybe wrong. I marked the Steering wheel rang in the picture. Does anyone Know what these clipped numbers after 410° mean? There is no difference between vehicle set on and off. That rotation number is strange, I’ve not seen that before. Also, check your steering settings at the top of the page; it’s not unusual for those to default to the wrong settings. Also, check the driving-assist’s for the same issue as they can revert to default when using any preset to setup a new profile. Using your settings Dean, identical Simucube settings (full power). I’m still having some issues with much too strong forces around the wheel center. Lets say I am accelerating out of a corner and controlling some oversteer under throttle, it seems that the wheel wants to always ‘fight’ me to get back to center and of course this causes exaggerated wheel input. Attaching what my OSW_Simucube.json looks like. This is a recent change I made so give it a try and let me know if it helps. I just started playing rF2 and I must say there is a huge difference between FFB. It’s like I have weak FFB in the faster corners, but too much FFB when trailbraking and the slower corners with more steering angles. Is this normaal for rF2? I was used to higher FFB in the really gast corners, but in rF2 it feels like its less. I also have a bad FFB in my opionion when I’m just steering a little. Then it feels like nothing compared to AC. I dont think that this is normal? It sounds like your FFB could be reversed? The minus 10000 is the important part that makes the FFB work in the proper direction. Edit if needed and save the file. Hi, want to give an update, in case others have the same problem like I had. That is not the problem, because this was -10000 already all the time. I tried al the settings mentioned above, but still have kind of “weak” FFB when in the fast corners, but too much when trailbraking. I have it enabled in mine and, it’s strength is set to 00010. Yes I have that enabled too with the same number. Could it have something to do with my OSW using 12.0 A at max torque? I do have a 30NM motor. large mige with 12 amps will generate ~13.4 nM . The json preset has that set in 18nM , you can change it to 13.4 and see if that is causing your problem. Try what Loukas suggests but, you can also disable the brake-effects and that will confirm it’s affect on your issue. If that turns out to be the cause, then you can reduce the brake-effects parameter until you reach a comfortable level. But how is that possible when I have a motor capable of 30 Nm? Anyway I’ll try 13,4 and I will also play with the braking effects. The servo has capability of peak 30nM with the according Amps to do so. When you apply 12amps it will deliver 13.4nM. I am talking about the large mige. I don’t know why the vendor that you bought your kit has set it that way but you could ask them.